A yard scene in a Golden Ring city. Roll the mouse over the picture to see the hillside of the beautiful city of Plyos. It was here that the artist Levitan lived and painted. The GOLDEN RING refers to a circular region around Moscow which contains many historical, small and large cities. These are historical gems, filled with exciting discoveries and beautiful scenery. It is called "Zolotoe Koltsoe" in Russian. Among the many communities, my favorites are Suzdal and Vladimir. In Suzdal, northeast of Moscow, I stayed in a small cabin at the ancient and still working convent of Pokrovskiy. I have a collection of pictures of Suzdal. Click here to see some of those photos. 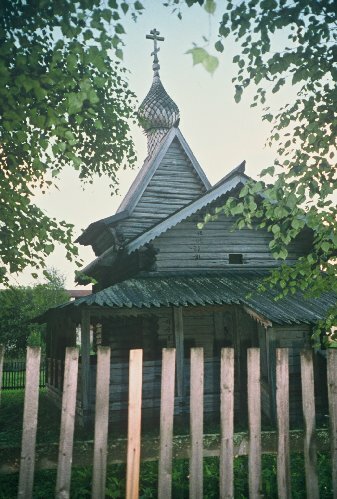 Suzdal has a wooden architecture museum which is inspiring to all who see it. I took a picture of an old woman in black coming out of a museum with a huge key in her hand and submitted it to a Russian magazine contest and won first place! Here in this town we saw many horse and donkey carts carrying hay. Also impressive in this town are many delightful village and dacha homes with their decorative wooden mouldings. Other Golden Ring towns are Vladimir, Kostroma, Yaroslavl, Rostov Velikiy, Pereslavl-Zalesskiy, Sergiev Posad. Vladimir, by the way, is the first stop on the Trans Siberian RR. Suzdal is officially protected from industrial development so the old architecture and buildings are kept intact. Green hills are all around and the river Kamenka.